The 2019 1 oz Silver Krugerrand is an excellent choice for investors wishing to add precious metal to their holdings. An affordable alternative to gold, silver is considered one of the most stable options for investors. This beautifully crafted 2019 1 oz Krugerrand is also an elegant addition to any coin collection, and you can find it now at coininvest.com. With a limited mintage of just 20,000, the 2019 1 oz silver Krugerrand is sure to be just as much in demand as its famous gold counterpart. The gold 1 oz Krugerrand coin was the first coin in the world to be produced purely for investment purposes and, since its launch in 1967, it has been a runaway success. The iconic coin celebrated its 50th year in 2017 and marked it with a new coin, the silver 1 oz Krugerrand. 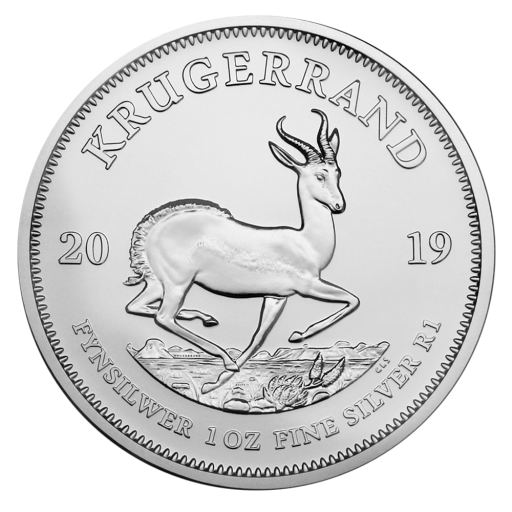 The 2019 1 oz silver Krugerrand is struck from .999 fine silver and carries the same legendary obverse and reverse designs as the gold coin. However, the silver coin does differ in one respect – it's the first Krugerrand to bear its denomination of 1 Rand. Of course, that's simply a nominal amount that recognises the coin's legal tender status and your 2019 1 oz silver Krugerrand is worth considerably more. Now in its third year, the 2019 1 oz Silver Krugerrand is an inspired choice for both new and established investors. More affordable than gold, yet every bit as tradeable, this limited edition silver bullion coin is a fine example of the skill and artistry that set South Africa's Rand Refinery apart. Don't miss the chance to add 2019 1 oz silver Krugerrands to your portfolio. Order today with coininvest.com for fast, insured delivery. These shimmering silver coins are available in individual sachets, tubes of 25 and boxes of 500.